Nissan has begun testing its first prototype vehicle that demonstrates piloted drive on both highway and city/urban roads. Nissan maintains two corporate visions of a sustainable mobile society: “Zero Emission” and “Zero Fatality.” For Zero Emission, the company’s goal is to eliminate the emission of CO2 gasses from Nissan vehicles; while Zero Fatality is an aspirational goal that aims to eliminate virtually all fatalities stemming from traffic accidents. “Vehicle Intelligence” will play a key role in realizing the concept of Zero Fatality; therefore, the company is developing an advanced form of vehicle intelligence called “Nissan Intelligent Driving,” which is comprised of various innovative features that will be introduced in stages. For Stage One, Nissan will offer “Piloted Drive 1.0” by the end of 2016 in Japan. Piloted Drive 1.0 allows for autonomous driving under heavy highway traffic conditions. 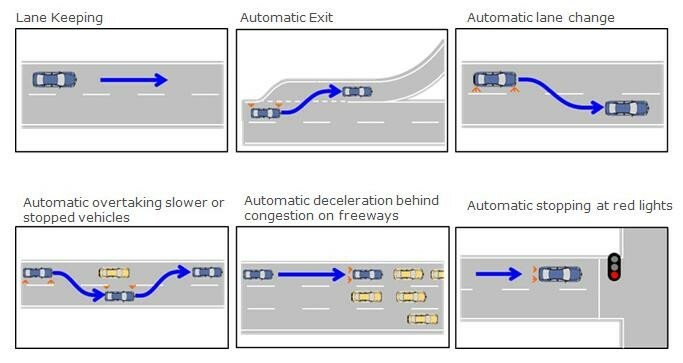 By 2018, the company hopes to implement a multiple lane piloted drive that can conduct lane changes on highways. And by 2020, a new technology will be introduced that allows vehicles to successfully manage city/urban roads- including intersections- autonomously. The prototype vehicle making its public debut today will be tested in actual traffic conditions on both the highway and city/urban roads to develop and further enhance Nissan Intelligent Driving for public use. The vehicle is based on the Nissan LEAF electric vehicle and it is equipped with features such as a millimetre wave radar, laser scanners, cameras, high-speed computer chips, and a specialized HMI (Human Machine Interface), just to name a few. All of this helps allow the vehicle to operate in an autonomous manner on both highway and city/urban roads except for setting destination points into the navigation system. These tests are planned for Japan as well as overseas in the near future. Nissan has developed two innovative technologies that can make piloted drive possible on city/urban roads. The first is the miniature, high-spec laser scanner. Currently in its prototype stages, the laser scanner determines the distance between the vehicle and its surroundings through the use of precise three-dimensional measurement that enables the vehicle to navigate routes in tight spaces. The other new technology is an 8-way 360-degree view camera system that allows for accurate routing decisions when driving through intersections and sharp curving roads. The new prototype vehicle possesses both of these innovative features, facilitating smooth transportation through complex traffic environments, helping the occupants feel as though they are in the hands of a skilled driver. “We at Nissan are setting clear goals and preparing for the implementation of piloted drive. The prototype that we’re introducing here today is proof of how close we are towards the realization of this goal. Nissan aspires for a safe and trouble-free motoring future, and we plan on leading the industry in the implementation of piloted drive,” Senior Vice President of Nissan, Takao Asami, said. Positioned on the center console, this device conducts various functions, such as shifting between Manual Drive mode (normal drive mode) and Piloted Drive mode (autonomous drive mode), automatic lane changes, and more. The area fully adopts a Thin Film Transistor LCD screen to display vehicle information based on the vehicle’s driving mode and driving environment. EV drive information is displayed in Manual Drive mode, such as the speedometer, distance to empty, etc., For Piloted Drive mode, along with the EV drive information, the vehicle’s surroundings are displayed in a virtual 360-degree view during higher speeds, and front view for lower speeds. When in Piloted Drive mode, the driving path, such as lane changes and intersections, is displayed in front of the driver. In order to observe the driving landscape during Piloted Drive, a virtual bird’s eye view is displayed on the large screen.